One of the challenges for a Pierateer in British Pie Week is how to fit in all the pies you want to eat and rate! That explains why for brunch on day one of British Pie Week I had two meat pies from Nice Pie - who fans of Pierate will know have produced countless Pierate Highly Recommended and Pierate Recommended pies (see the table of past Nice Pies here!) The pies were the Steak, Ale and Stilton and the Braised Beef, Roasted Onion and Cheddar Pie. 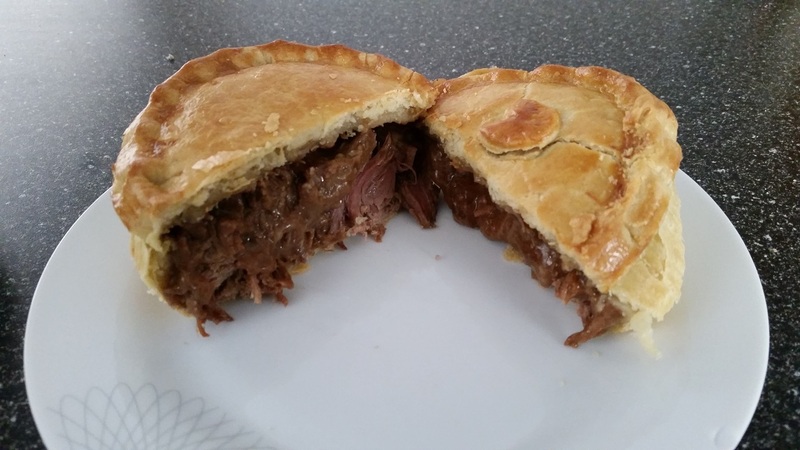 With all the exotic pies we’ve rated from Nice Pie over the years, you’d be forgiven for thinking that they only do pies full of meat you’d never expect to be sold in a pie! But as delicious as the kangaroo, zebra and wild squirrel pies were, sometimes people may just want a “typical” British pie to eat! Fear not, for Nice Pie haven’t neglected their homely, British pie flavours for the sole purpose of exotic pie production! 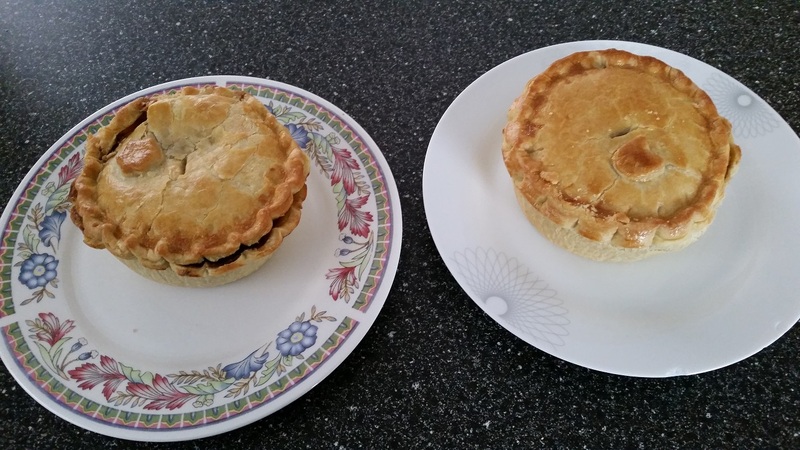 Included in the traditional range of pies are these two steak and cheese pies, both of which went down very nicely indeed when eaten and rated! 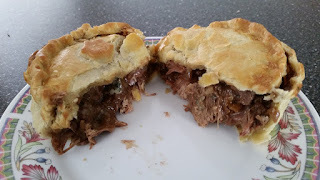 It was the filling that really stood out in these pies, absolutely bursting with meaty steak and beef chunks that were so tender and flavoursome. It really amazes me how they can pack so much meat into these pies, as the capacity is always so full to the brim! The only slight downside is that with so much meat in there it can mean the pastry struggles to hold all the filling in, especially if you try to eat it by hand as I did. This is however a very small criticism as the main thing is to have a packed, flavoursome pie filling and this pie certainly provides that! Out of the two, the steak and stilton stood out a bit more, with a bit more cheese flavour coming through and the lack of distraction from the onion. But that is really my personal preference, and I would certainly say both were very good pies. 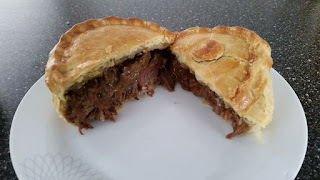 I still don’t know quite how they manage to make the meat sooooo tender and flavoursome, unlike a lot of the meat in other pies I eat which can be a bit dry and chewy in places even if the pie filling is very moist. The gravy was pretty much spot on and the cheese flavoured both pies well, yet wasn’t overpowering. The pastry is nicely golden (although could be a little stronger in colour on the sides/base for piefection) holding in the filling admirably well considering how good the capacity is and moist the filling can be! The shortcrust pastry compliments the pie well and as a whole really is a top product. When nit-picking on the details, the pastry was a little crumbly in places, particularly around the lid to sides join, which became loose upon picking the pie up and eating it, but considering these pies had travelled by post to us it’s hard to be overly critical of this. A slightly crisper side and base pastry would have been ideal but it’s hard to overly fault the quality of these pies. Once again Nice Pie have done us proud, producing two more Pierate Highly Recommended pies – and while it’s hard to resist the amazing range of exotic pies Nice Pie do, you would certainly be missing out if you didn’t tuck into a more traditional steak and cheese pie from their range when given the chance! The eager eyed among you will have noticed in our Pie Rankings we've rated a Steak and Stilton pie from Nice Pie a few years ago, which scored a bit lower than this Steak, Ale and Stilton pie. I think this is an encouraging sign they are still striving to improve their pie recipes and also reflects that the individual pies (verses the family pie rated before) are that bit better in terms of pie:filling ratio. I’ve given these two pies today the same score due to the similarity of the fillings and would suggest you choose based on your preference of ale and stilton or onion and cheddar. Or better still, do what I did and have one of each!